The pre-season honeymoon period is over. In his first meaningful game in charge, Louis Van Gaal’s threadbare side fell to the club’s first opening day defeat at Old Trafford in Premier League history. United unsurprisingly continued with the 3-5-2 shape that LVG had used throughout pre-season (and indeed throughout the World Cup). More of a surprise to some observers was his decision to select two young players with no prior senior experience for the club – Tyler Blackett played on the left of the back three, with Jesse Lingard, an attacking midfielder by trade, used as a right wing back. Another attacking midfielder, Ashley Young, was again fielded as the left wing back. Javier Hernandez partnered Wayne Rooney upfront, with Juan Mata just behind in his favoured trequartista role. Swansea manager Garry Monk sprung no such surprises with his starting selection. The visitors were 4-2-3-1 from the outset with wingers Dyer and Routledge sandwiching new man Gylfi Sigurdsson in the number 10 position. Wilfried Bony, scorer of two goals in three games against United last season, was the lone striker, with new signing Bafetimbi Gomis left on the bench. Returning loanee Ki partnered playmaker Jonjo Shelvey in midfield. Immediately apparent from the first whistle was how much higher United were looking to play as a unit than in recent years. Under both Ferguson and Moyes, the home side generally preferred to defend relatively deep in two banks of four. This tendency was exacerbated by the aging and slowing of Rio Ferdinand and Nemanja Vidic, with the former in particular often playing much deeper than whichever partner he was paired with to compensate for his failing legs. Louis Van Gaal, however, is a manager who advocates both pressing in the opposition half and a high defensive line and we saw both today, particularly in the first 15 minutes. Twice in this period, first Ashley Williams and then Ki were forced into wayward passes in their own third by effective United pressure. This period of the game also showed the danger of taking this approach when operating a wing-back system however. Swansea’s plan was clear – to choke United off in their their defensive third and to then play quick, direct passes into the space left vacant by United’s onrushing wing-backs for Dyer and Routledge to run on to. Within the first five minutes, they almost had the lead through this avenue. Jonjo Shelvey played a cross-field ball to the left. Jesse Lingard allowed Wayne Routledge to run in front of him to collect but the Swansea winger’s first touch let him down. Soon after however, Swansea would open the scoring through a break down the right-hand side, before working the ball into the middle for Ki to slot home from the edge of the area. Ander Herrera was culpable – Ki was his man and he simply didn’t track him. So it was Swansea who were looking the more dangerous despite seeing much less of the ball. The home side, on the other hand, were creating nothing. United’s top seven passing combinations in the first half featured their back five – a statistic that drives home how poor United were at working the ball into the final third. Most of their play was going down the right – a common feature of previous regimes. The injury-enforced replacement of Lingard by Januzaj looked like leading to this strategy bearing fruit, but on a couple of occasions the Belgian found himself one-on-one with Swans left back Neil Taylor only to come a cropper due to a lack of support. This hinted at the key reason for United’s attacking impotence – a numerical disadvantage in wide areas. If you play three centre backs against one striker as United did today, that surplus hurts you somewhere else on the pitch. For United today that was on the flanks – delightful for the away side, who defended relatively narrowly and left their wingers positioned high for the counter. What may gall some United fans about this is that this problem was blatantly apparent during the World Cup too. While LVG’s 3-5-2 was extremely effective against possession sides like Chile and Spain , it was not so against more counter attacking outfits like Costa Rica, Mexico and Argentina. Van Gaal’s insistence on persisting with three centre-backs against an ultra-defensive Costa Rica side with only Joel Campbell up top was particularly crazy and almost resulted in their elimination at the hands of a much weaker team. To his credit, Van Gaal admitted his mistake and changed it at half-time. Nani was introduced for Hernandez and United were now 4-2-3-1 with the substitute on the left and Rooney in a lone striker role. Jones went from right-sided centre back to right full, with Young now a conventional left full. 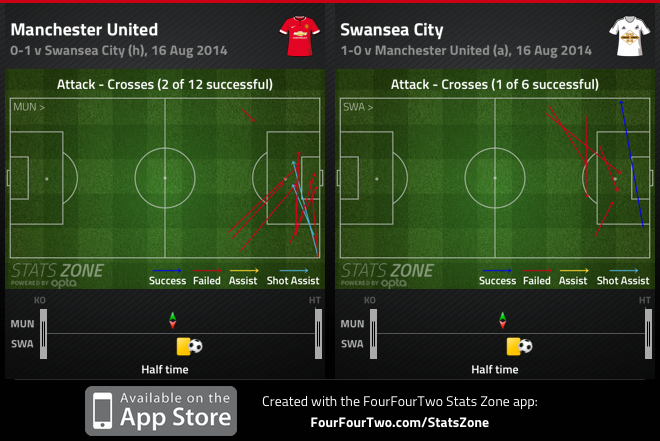 Immediately United looked both more balanced and more capable of working the ball forward. Januzaj’s game in particular was transformed as he now had support behind him. He completed four dribbles in the second period, as compared with none in the first. He now had a buddy to support and overlap him and Taylor was flummoxed. He was unsurprisingly booked for a foul on Januzaj and was removed shortly after in favour of Dwight Tiendalli. Again unsurprisingly, United’s equaliser came from a corner won down that side. Swansea weathered the storm however and nabbed the winner in the 72nd minute. If the first half demonstrated the problems with LVG’s 3-5-2, this goal demonstrated the problems he has with personnel. Chris Smalling, who had done a wonderful job all game on Wilfried Bony, conceded a seemingly innocuous free kick in a central area for his first foul of the day on the Ivorian. His partner, young Tyler Blackett, gave the ball back to the visitors before his side was set. Swansea took it quickly, feeding lightning quick substitute Jefferson Montero on the left wing. Ashley Young was caught out of position under his cross at the back post. Wayne Routledge’s subsequent connection delivered the ball into path of the unmarked Sigurdsson at the edge of the six yard box, whose shot squirmed past David De Gea. This was some debut for Sigurdsson – a goal and an assist to his name. Against the run of play it may have been, but the goal was hardly surprising. An untested young centre half shows his inexperience and a winger-by-trade fails to adequately take up an optimal left back position. United had already introduced Fellaini for the disappointing Herrera five minutes before the winner. Their response to that goal was to swap him with Juan Mata and go route one to Sideshow Marouane in the number 10 position, a la Belgium v Algeria during the summer. Unfortunately he was not nearly as effective as he was in that game, as the immense Ashley Williams continued to mop up whatever came his way. Nani and Januzaj swapped wings in order to go on the outside and provide crosses but they never looked like doing the trick. A deserved victory for a Swansea side who executed their strategy to perfection. They countered well in behind United’s wing-backs in the first half, frustrated United’s attack and took their chances when they presented themselves. In Ashley Williams they have one of the most underrated centre backs in the Premier League. His penalty box defending and his covering in behind his left back today were both extremely impressive. Despite the rampant optimism of pre-season United have a long way to go to break back into the CL places. While admittedly missing five probable first-teamers today, the presence of two young debutants shows how dreadfully lacking their squad is in certain areas. The addition of Marcos Rojo, a man who can play at centre back, left back and left wing back is vital as the likes of Ashley Young are patently not as versatile and players like Lingard and Blackett are not yet ready for regular football at the top level. Ander Herrera, who is an energetic player and fits with LVG’s high-tempo pressing philosophy, will have to improve defensively if he is to adapt to a deeper midfield role. 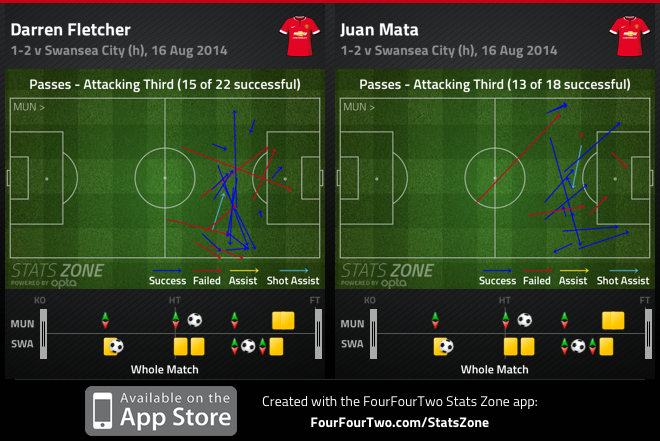 Juan Mata, who only completed 13 passes in the final third today (less than Darren Fletcher) has no excuse for this level of performance. There were positives however. Both Jones and Smalling were impressive. Jones showed his adaptability by playing well in two positions and also his determination by making two vital last ditch tackles. 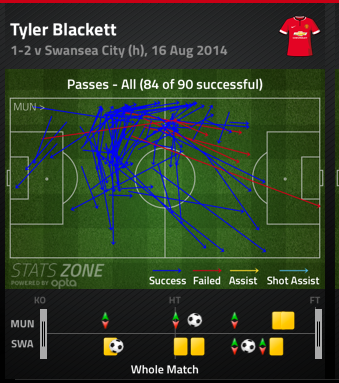 Blackett, despite his error for the winner, was excellent in possession. He was United’s top passer on the day and played numerous accurate long passes to initiate his side’s attacks. The standout player was of course Wayne Rooney however, who scored the equaliser and also hit the upright with an excellent free-kick. So back to the drawing board perhaps for those pundits predicting Swansea’s demise this season. And back to the drawing board for Van Gaal too. The 3-5-2 is inappropriate against counter-attacking sides, particularly those fielding a lone striker. Whether or not he will acknowledge this may define United’s season.